This painting guide for Great Western locomotives has been sourced over the years from official records and specifications, together with further information and input from various professionals and organisations such as Alan Brackenborough and Tyseley locomotive works. This guide will start with the basic painting details from the end of the First World War and then develop and expand to cover lining, lettering and variations that have occurred over the years. Any input or comments will be most welcome to help build up the definitive GWR loco livery guide. Boiler and firebox cleating plates (up to rear edge of smokebox). Handrails and brackets. (Except on some locomotive vertical cab rails). Top feed clack covers either side of brass safety valve cover and pipework. Cab sides, cab front, cab interior surfaces (including roof). Tender body sides and rear above footplate level. Tender and locomotive toolboxes (outside). 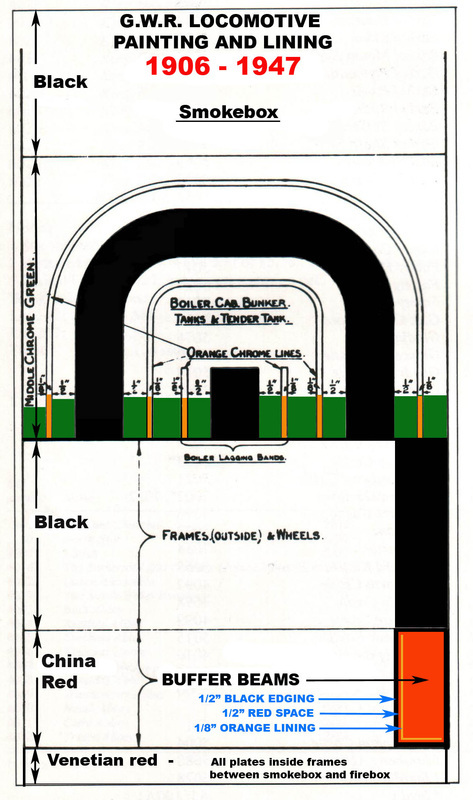 Tank sides and fronts (Except Panniers with tanks finishing at the FRONT of the smokebox in which case the fronts are painted black). Tops of pannier and saddle tanks and fittings. Ejector and pipe running down the right hand side of the boiler behind the handrail from firebox to smokebox. Chimney, except for polished copper top. Shelf and front plate of bunker inside cab of tank engines. Ground of name and number plates around letters and figures. 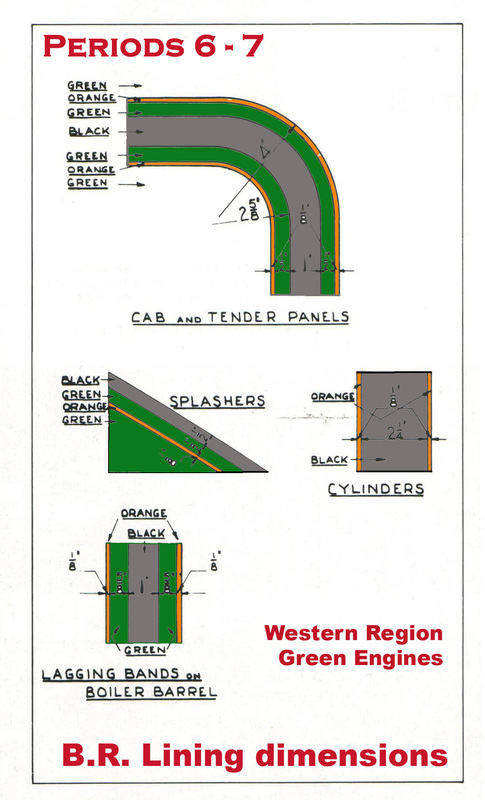 All horizontal footplate surfaces including narrow sections below cab. Drag boxes below cab and front of tender. All areas below footplate level. Tender footplate including the narrow strip all around the main tank. Bead around top of tender sides and rear. All areas below footplate level including brake, draincock and sanding gear. Tender and bunker coal space and fittings. All areas of tender front. Front locomotive buffer beam including buffer bodies. Rear tender buffer beam including buffer bodies. Vacuum pipe stands (within the area of the buffer beam on the tender). Inner faces of locomotive main frames, including stretchers, between firebox front and smokebox rear or rear face of inside cylinders. Regulator handle (except for the grip area). Reverser screw handle (except for the grip areas). Safety valve cover (bonnet) on engines with polished copper-cap chimneys. Spectacle plate (cab front) window frames. Brake valve, gauge glass frame, steam gauge bodies and blower valve. Beading running down front of cab sides. Beading running down rear of cab sides. Name and number plate letters, numbers and surrounding frame beading. Top cap area of chimney. Pipe work inside cab on backhead except for large brake valve pipe (black) and steam heat control pipe (off white lagging). All motion parts, including slide bars, valve gear, coupling rods, connecting rods and inside motion. Buffers and shanks on prestigious locomotives. Grip areas of regulator and reversing handles in cab. Centre quadrant slot area of reversing rod.